If someone were to take a look at my last few posts, they might think this was a blog devoted just to desserts. In the last five posts I have shared a recipe for chocolate mousse, two cookie recipes and a cake. And today I’m posting another cake. 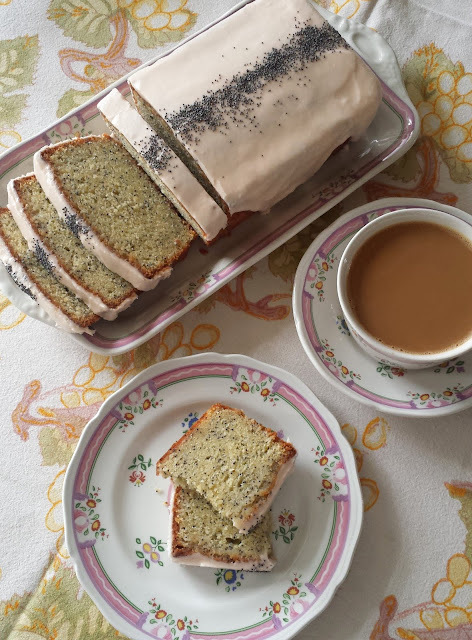 I promise to get back into savory mode as we head into spring…but I just couldn’t resist sharing the simple, delicious and oh-so-perfect-for-spring cake that I served to my family for Easter this year. I have actually shared the recipe for this cake before (in the Holiday Almond Cake Squares that I posted several Christmases ago). But I wanted to share it again to demonstrate how versatile it can be….and also to emphasize how much I love it. I don’t think it is a secret that I really like cake… all kinds of cake. 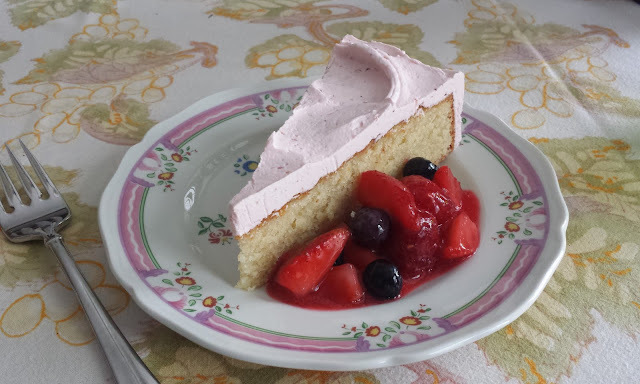 I eat cake almost every day…and I have shared many different kinds of recipes for cake over the years. But when it comes to cakes for dessert, this almond cake is the cake. If I could only have one cake to make for birthdays and special occasions for the rest of my life, this is the cake I would choose. It is perfect in every way. It bakes into beautiful, level, fine-grained layers that slice cleanly and neatly. It can be baked in just about any kind of shape (square and round…small and large…). It can be eaten plainly—with nothing more than a dusting of powdered sugar…or a scattering of toasted almonds. It is wonderful accompanied by a little fruit…fresh, poached or roasted. And it can be covered with almost any favorite buttercream or glaze. And it is of course delicious! If you love almond flavor, this will probably become your favorite cake too. I have been making this cake for more than twenty years. And up until about four years ago my love for this cake was marred (only slightly, I admit) by the persnickety mixing method. As originally published in Madeleine Kamman’s The New Making of a Cook, the recipe directed you to finely grate the almond paste before creaming it with the butter and sugar. If you have every worked with almond paste, grating small amounts is a wonderful trick for getting this moderately stiff and sticky substance evenly distributed throughout a batter…or over a pastry or bar cookie. But grating ten and half ounces of it is a sticky mess. The fact that I continued to make this cake despite how I felt about grating the almond paste says a lot about how much I love it. But just in case it was out there, I was always on the lookout for another way to blend the almond paste perfectly and smoothly into the batter. Then, a few years ago I ran across Thomas Keller’s version of this cake in his book Bouchon. (There are many, many versions of this cake…it is so lovely that most pastry chefs have it in their repertoire in some form.) His method for incorporating the almond paste is fantastic. Instead of softening the butter before creaming it with the almond paste and sugar, the butter is added while it is still cold. Because the butter is still hard when the creaming process begins, it smoothly absorbs the almond paste bit by bit. By the time the action of the paddle has softened the butter, it has absorbed all of the almond paste and sugar into a stiff, thick, uniform mass. Continued creaming warms and softens the butter while simultaneously incorporating air and eventually produces a perfectly light and fluffy mass of creamed butter, sugar and almond paste. Because the proportions of the recipe I use differ slightly from Keller’s recipe, I have adapted his method to work with my recipe. I leave two thirds of the butter cold and bring the other third to room temperature. After creaming the cold butter with the almond paste and sugar until everything is completely smooth, I beat in the remaining softened butter and continue to cream until the whole mass is light and fluffy. Basically Keller’s method seems to work well if the weight of the cold butter is about half the weight of the almond paste. I have gotten lumps of almond paste that didn’t want to smooth out when I have tried to use all cold butter in my version of the recipe. For Easter this year I frosted the cake with a fresh strawberry buttercream. 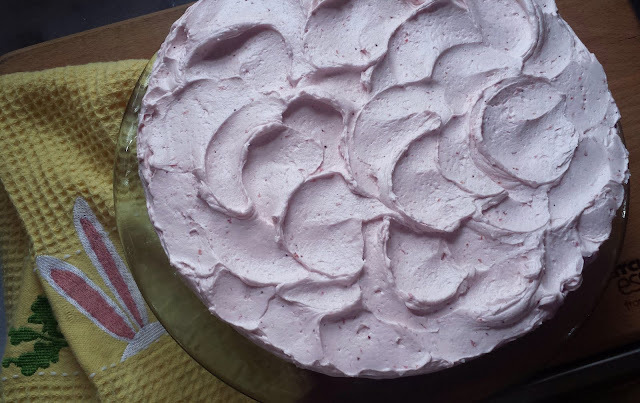 The recipe is the one my friend Chef Nancy uses in her bake shop and it is basically a Swiss Meringue style buttercream with puréed strawberries beaten into it. It is light, fresh and delicious—and sets the almond cake off beautifully. 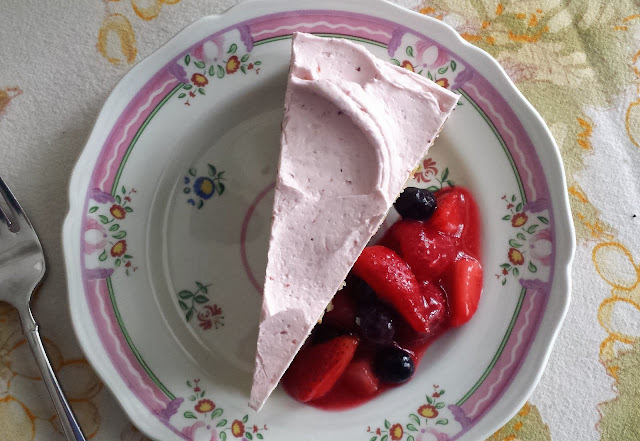 If you have never made Swiss Meringue buttercream, it is a fairly straightforward operation. Classic recipes are based on a formula where egg whites, along with about twice their weight in sugar are placed in a mixing bowl and heated over a bath of simmering water until the sugar has dissolved and the mixture is hot to the touch. The temperature of the mixture should be in the 150°F to 160°F range. Once you have made it a few times, you will not need a thermometer—you will know by touch if it is ready. While this mixture is heating, it must be stirred constantly. You may use a rubber spatula for this, but I find it easiest just to grab the whisk attachment of my mixer at the top and use this to keep the mixture moving over the heat. or is too stiff, warm it briefly (you don’t want to melt the butter—just get the bowl warm to the touch) over the simmering water you used to warm the egg whites and then return it to the mixer and beat with the paddle attachment until smooth. You will find all kinds of recipes for Swiss Meringue buttercream—all with slight variations in quantities of whites, sugar and butter. As long as the ratios of the ingredients are in the ball park of what I have described, the recipe should work just fine. If you already have a favorite recipe, by all means use it as the base for your strawberry buttercream. I garnished my Easter cake with my favorite fresh berry compote. I make this particular compote all the time during the spring and early summer months. It is wonderful with ice cream, angel food or pound cake, lemon tart…fritters, pancakes and waffles…just about anything that would be set off to advantage by a few berries and a little sauce. Because none of the components are cooked, the compote is bright and fresh—perfect for spring and summer. Easter is of course over for the year, but there are many spring and early summer celebrations yet to come—graduations, bridal showers, Mother’s day… This cake would be just the thing for any one of them. 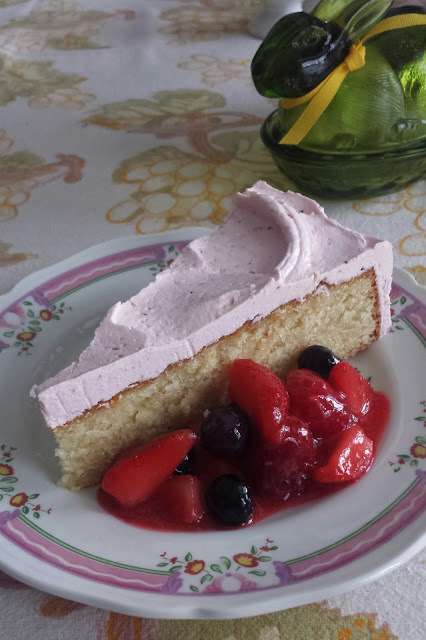 But even if you don’t make the compote….or the buttercream…I hope today’s post inspires you to try this amazing cake. Once you make it, I think you will find yourself wanting to make it often…for any (and possibly every) occasion. Preheat the oven to 325°. Butter a 10- by 2-inch round cake pan. Line the pan with a round of parchment, butter the parchment. Flour the pan, knocking out the excess flour. Place the sugar and almond paste in the bowl of a stand mixer and using the paddle attachment, mix on medium low to begin breaking up the almond paste. Add the cold butter and increase the speed to medium high (you may need to put some plastic wrap around the mixer to prevent the almond paste, sugar and butter from being flung out of the bowl). Beat until the mixture is smooth. When no lumps of almond paste or butter remain, increase the speed to high and add the soft butter. Cream until light and fluffy—about 5 minutes. Scrape down the bowl add the vanilla and mix in. Add the eggs one at a time, beating briefly on medium-high speed after each addition to return the batter to fluffiness and scraping down the sides before each next addition. and bake for 35 to 40 minutes. The cake is done when it is golden brown and a toothpick inserted in the center comes out clean. Unmold immediately onto a plate. Invert onto a rack to let the cake cool right side up. Cool completely. The cake may be frosted or simply dusted with powdered sugar and served plain or with whipped cream and berries. Serves 12 to 16. Place the egg whites and sugar in the bowl of a stand mixer and place over a pan of simmering water. Stir constantly—with a whisk or rubber spatula—until the sugar is dissolved and the mixture is hot to the touch. An instant read thermometer will read between 150°F and 160°F. Using the whisk attachment, whip the mixture on high speed until the mixture has formed a thick, glossy, billowy meringue. Continue beating until the bowl no longer feels warm to the touch. Reduce the speed to medium-high and add the butter two or three tablespoons at a time, beating until it is completely absorbed. Stop the mixer, scrape down the sides. Whisk in the strawberry purée. If the mixture appears curdled, place the bowl back over the pan of simmering water just until the bowl is warm. You don’t want the butter to melt you just want the bowl to be warm. Return the bowl to the mixer and beat until the mixture no longer appears separated. Switch to the paddle attachment and continue to beat on medium or medium low speed until the mixture is very silky and smooth and has lightened to a lovely pale pink color. Makes about 5 cups of buttercream. (You will only need about half of this for the Almond Cake.) The buttercream may be refrigerated for a week or frozen for six months. Allow the buttercream to come to room temperature before rebeating to restore its silken texture. Note: To make strawberry purée, wash and hull 9 oz. of strawberries. Purée the hulled strawberries in the food processor until completely smooth. If made ahead, bring to room temperature before adding to the buttercream. Make a raspberry sauce: Purée the raspberries and pass through a fine-meshed strainer, pressing hard with a ladle or spatula in order to extract all of the purée. Stir in the sugar. Add lemon juice to taste. About an hour or two before you plan to serve the compote, place the strawberries in a bowl and sugar lightly and toss to combine. When you are ready to serve the compote, add the other berries to the strawberries along with the raspberry sauce, folding carefully to distribute the berries and until all of the berries are coasted with the sauce. I'm a long-time reader from Connecticut. I've learned so much from reading your blog, and many of the recipes you've posted have become part of my regular cooking and eating - French Apple Tart, Pâte Brisée, New Potato & Kale Tortilla, and basic Crumb Muffins, to name a few. Thank you. I look forward to making this almond cake. I can't tell you how much I appreciate your comment. My blog does not attract a lot of comments...but I have learned over the years that there people out there like you who are quietly learning...and cooking... And that's one of the reasons I continue to do it. Thank you for taking the time to let me know! And I hope you enjoy this cake!